Biography*: In 1296 he swore allegiance to Kign Edward I of England. Biography*: John Lyon, 3rd Lord of Glamis (1431– 1 April 1497) was a Scottish nobleman. Born in Angus, he was the second son of Patrick Lyon, 1st Lord Glamis, and inherited the title on his brother's death in 1486. He attended university, possibly in Paris. He was active in royal service during the early reign of James IV of Scotland, and was appointed justiciar north of Forth. Before 1479 he married Elizabeth Scrymgeour, daughter of John Scrymgeour of Dudhope, constable of Dundee and they had four sons and seven daughters. The eldest, John Lyon, succeeded his father as Lord Glamis. The three younger sons: David Lyon of Cossins, William and George, were killed at the Battle of Flodden in 1513. [S861] Ancestry.com, online www.ancestry.com, 0861 - 9948 - Patrick Lyon.docx. [S746] Wikipedia, online http://Wikipedia.com, https://en.wikipedia.org/wiki/John_Lyon,_3rd_Lord_Glamis. [S861] Ancestry.com, online www.ancestry.com, 0861 - 9947 - Elizabeth Scrymeour.docx. Biography*: Patrick Lyon, 1st Lord Glamis (1402 – 21 March 1459) P.C. was a Scottish nobleman, created Lord Glamis on 28 June 1445. He was the son of Sir John Lyon of Glamis (c.1377–c.1435) and Elizabeth Graham, daughter of Sir Patrick Graham of Dundaff and Kincardine and Euphemia Stewart, Countess of Strathearn. Sir John was the son of Sir John Lyon (d. 1382) and Princess Joanna Stewart, daughter of Robert II of Scotland. Patrick Lyon was hostage in England for King James I from 1424 until 9 November 1427 when he was exchanged for another hostage. He was one of the Lords Auditors (1450–1451) and Master of the King's Household (1450–1452) to King James II. He was Ambassador to England (1451) and again (1455). He was Keeper of the Castles of Kildrummy, Kindrocht and Balveny (1456–1459). [S746] Wikipedia, online http://Wikipedia.com, https://en.wikipedia.org/wiki/Patrick_Lyon,_1st_Lord_Glamis. 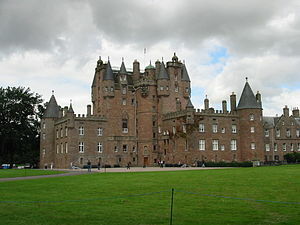 [S746] Wikipedia, online http://Wikipedia.com, https://en.wikipedia.org/wiki/John_Lyon,_Lord_of_Glamis. Biography*: Sir John Lyon, Thane of Glamis, jure uxoris Thane of Tannadyce (c.1340 – 4 November 1382), was Chamberlain of Scotland between 1377 and 1382. Sir John Lyon was the son of Sir John Lyon (c. 1290 - ? ), feudal baron of Forteviot and Forgandenny in Perthshire, and Curteton and Drumgowan in Aberdeenshire. Sir John is widely accepted as being the progenitor of Clan Lyon, a claim verified by renowned historian Sir Iain Moncreiffe of that Ilk. His origins were French, his surname being an anglicised version of the Norman family "de Lyon-Levieux" of Contentin Peninsula also written in book as "de Leonne". He was first appointed to a position at the Scottish court sometime prior to 1368 in the reign of David II, when he was given the responsibility of examining the records of the Chamberlain. He was appointed Keeper of the Privy Seal upon the accession of Robert II; from c. 1375 he was the Keeper of Edinburgh Castle, and was appointed Lord Chamberlain in 1377, both positions he was to hold till his death. From at least as early as 1367 he started to acquire various properties, from the Earl of Ross in 1367, from John de Hay in 1368. He acquired the thanage of Glamis from his future father-in-law in March 1372. He was knighted sometime prior to 1377. He was killed (perhaps rather treacherously) on 4 November 1382 during a quarrel with Sir James Lindsay of Crawford, nephew of the King, near Menmuir in Angus. Sometime in 1376, Sir John Lyon married Princess Johanna (Jean), daughter of Robert II and Elizabeth Mure, daughter of Sir Adam Mure of Rowallan. The Princess was the widow of Sir John Keith, eldest son of the Earl Marischal. After Sir John Lyon's death, Johanna married Sir James Sandilands. Sir John Lyon and the Princess had only one child, another Sir John Lyon. On 28 June 1445, his grandson, Patrick Lyon was created Lord Glamis. In 1606, Patrick, 9th Lord Glamis was created Earl of Kinghorne. [S746] Wikipedia, online http://Wikipedia.com, https://en.wikipedia.org/wiki/Thomas_Dunbar,_5th_Earl_of_Moray. Biography*: John Dunbar, 1st Earl of Moray (Second Creation) was a Scottish nobleman. Moray was the son of Sir Patrick Dunbar and Isabella Randolph, a daughter of Thomas Randolph, 1st Earl of Moray (First Creation), and a younger brother to George I, Earl of March. Therefore, he was nephew of the previous Earl of Moray, John Randolph, 3rd Earl of Moray (First Creation). However he did not inherit the earldom automatically. On his uncle's death it reverted to the crown, and was only awarded to him a few years later around 1374. Moray was one of the senior commanders under James Douglas, 2nd Earl of Douglas, who led the raid into England in July–August 1388 that culminated at the Battle of Otterburn, where he was in control of the right flank of the Scottish army. Some sources state that he spent the larger part of the fight without his helmet, because of the speed with which the English attacked. [S746] Wikipedia, online http://Wikipedia.com, https://en.wikipedia.org/wiki/John_Dunbar,_Earl_of_Moray. Biography*: He died in 1356 at Candia, Crete, Greece, enroute to the Holy Land.